Aleister Crowley�s ascension into the pantheon of alternative gurus was cemented by his appearance on The Beatles� Sgt. Pepper�s Lonely Hearts Club Band album cover. Unfortunately, he was known more for his reputation as "The Beast 666" and "The Wickedest Man in the World." All well and good for publicity, but this infamy eclipsed his teachings, as did his technical and opaque writing style, meant more for adepts contemporary to him than the average modern reader. Enter Lon Milo DuQuette to decipher and explain Crowley�s texts and more important rituals. The Magick of Aleister Crowley is a clear introduction to the works of Crowley by a modern master of the occult and one of the wittiest writers in the field. DuQuette takes the mystery out of both the rituals themselves and Crowley�s writing in this modern grimoire. Step by step, he presents a course of study in plain English, with examples of rituals and explanations of their significance. DuQuette also includes a course of study for Crowley�s original works with an extensive bibliography and fastidious footnotes. 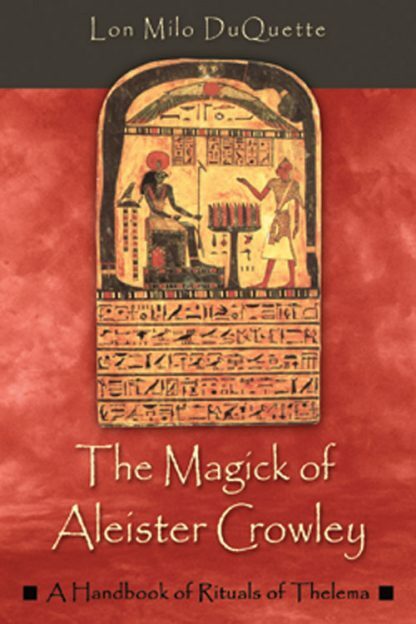 Formerly titled The Magick of Thelema, this revised edition features extensive corrections, a new introduction, and a new ritual, "The Rites of Eleusis." This is the perfect introductory text for readers who wonder what the works�rather than the myth�of Aleister Crowley are all about. Listen to Lon Milo DuQuette on the Weiser Books Radio Hour!